If ThrillerFest doesn’t have a Dynamic Duo category, it ought to, and Lynn Sholes and Joe Moore should be the winners. This writing team has once again produced a thriller that will excite conspiracy theorists, while the rest of us can sit back, enjoy the many surprises of the well-crafted plot, and be thrilled by the fast-paced action. At a dig site in Mexico City, magazine journalist Seneca Hunt is reporting on the opening of Montezuma’s tomb when it’s discovered that the remains of the Aztec emperor are missing. Before she can investigate further, what appears to be a terrorist attack kills the dig team including her fiancé. Seneca barely escapes the carnage not knowing that a passing glimpse of an out-of-place object in the tomb may have sealed her fate. She soon learns that someone is stealing the burial remains of the most infamous mass murderers in history. Seeing a story in the making, her research uncovers a plot to slaughter millions in the name of an ancient cult. Seneca teams up with a bestselling novelist to prove the threat really exists while staying one-step ahead of those who want her dead. As time is running out, she must follow a 2000-year-old trail leading back to the death of Jesus Christ. Sholes and Moore use the media hype of the Aztec calendar possibly predicting the end of the world on 12.21.12 for the background of The Phoenix Apostles. The challenge to see that the prophecy of the calendar doesn’t come true, no matter what the costs, drives the story and not in the way you might expect. The book’s heroine, Seneca Hunt, whose journalist’s curiosity from the very beginning leads to her a scheduled and unwilling involvement in a bloody Aztec ritual, uncovers more than even she could have expected when beginning her search for the reasons behind the supposed terrorist’s bombing in Mexico. Her search takes her from the pyramids of Mexico to the opulence of the Bahamas, backward in time, and forward toward the calendar’s last days. As the Aztec calendar date approaches, speculation of its meaning might fill newspapers and blogs with the same sensationalism the preceded the arrival of Y2000, but nothing to come will be as exciting and thrilling as The Phoenix Apostles. Reading the book might keep you up at night and have you biting your nails, but then a good thriller should. The Phoenix Apostles is Sholes’ and Moore’s fifth thriller and arrives in bookstores this month from Midnight Ink. Sholes’ and Moore’s four other books have been published in more than twenty languages. Lynn Sholes and Joe Moore are the co-authors of the international bestselling Cotten Stone thrillers The Grail Conspiracy, The Last Secret, The Hades Project, and The 731 Legacy. Their novels have been translated into over 20 languages. 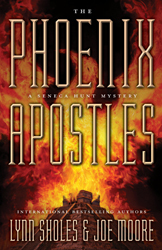 Their latest thriller, The Phoenix Apostles, is in stores and online June 8. To learn more about Lynn and Joe, please visit their website.